The "Father of Modern Karate"
The word karate is a combination of two Japanese characters (kanji) – “kara” and “te”. The kanji “kara” and “te” are now interpreted as “empty hand”. 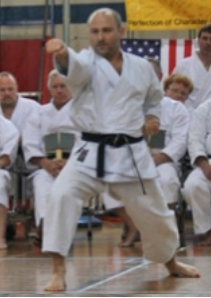 Adding the suffix "-do" (“karate-do”), meaning "way," implies karate as a total way of life that goes well beyond the self-defense applications. Moreover, adding a “ka” (Karate-ka) means “a practitioner of karate”. If we were to define Karate in only one word it would be “Budo” -- a “human development tool” used to cultivate great human character. Besides Budo karate is made up of three other themes: self-defense; physical education; and sport. As Self-Defense, Karate is a Japanese martial art whose physical aspects seek the development of offensive and defensive movements against armed and unarmed opponents. It consists of dynamic offensive and defensive techniques which uses all parts of the body to their maximum advantage. This is done by training and forging one’s own body into a weapon keeping in mind that karate is a defensive art. With regard to Physical Education karate is unique in that it uses every part of the human body in its practice. The karateka will forge his/her body into a weapon to use as a defense. Karate is one of the only sports that you do not need any team or equipment to practice. In addition, you can have limited space and still practice the art effectively. Essentially, karate can be performed anywhere, anytime, by anyone no matter the age or their physical condition. Lastly, karate has become a worldwide Sport with its inclusion in the Olympics in 2020. Warwick Shotokan promotes and encourages our students to compete at local and national tournament. The use of tournaments allows the karate-ka to build confidence to perform in front of strangers and be judged on their skills. These are life lessons that will help them at school and work. Oriental martial arts are of ancient origin. As far back as 3000 B.C. there existed in India a warrior class that was taught unarmed combat. Buddhist texts tell of at least three different systems. The founder of the Zen sect of Buddhism, Daruma Taishi (Bodhidharma), was born into the warrior class in India at the end of the 5th century BC. As a boy, he was taught unarmed combat, but decided as a young man to become a Buddhist monk.After several years of study, Daruma decided to travel and spread the teachings of the Buddha. Eventually his travels led him to China, where he took up residence at the Shaolin monastery about 500 BC. According to legend, when Daruma began to teach the monks at Shaolin, he found they were unable to absorb his teaching or to perform the difficult ascetic practices that were intended to lead to “satori” or enlightenment. The monks’ very poor physical condition was their biggest impediment to progress. Daruma began to teach them the system of exercises that he had learned as a boy, and a set of physical and mental disciplines known as the “I Ching Sutra”. With this training, the monks eventually became the most formidable fighters in China. The art they practiced became known in Chinese as Shaolin-szu kempo and in Japanese as Shorin-ji kempo. The roots of modern Karate are found in Okinawa, the largest island of the Ryukyu chain. Okinawa lies three hundred seventy miles from Taiwan, and five hundred miles from Foochow, China. The Ryukyu Islands were divided into three kingdoms from the first to the 15th century, ruled over by chieftains who placed a high value on military skills. Wars among the chieftains and their kingdoms were frequent, especially in the seventh and eighth centuries. In the tenth century, many Japanese sought refuge in Okinawa from the Great War between the Taira and Minamoto clans in Japan. Many of these refugees were warriors, and their fighting arts and skill were highly respected by the Okinawans, who at the time had no martial art systems as such. Okinawa’s location in the East China Sea allowed social and commercial contact with China, Korea, Japan, Java, Sumatra, Siam, Arabia, and Malacca. It is probable that seamen and traders from these regions introduced some of their own fighting arts to the Okinawans. Shohashi, King of Chuzan, accomplished the unification of the three kingdoms around 1429. In about 1470, Shohashi banned the possession of weapons by the people of the Fukyus, in order to protect his position as king. This edict served to encourage the development of unarmed fighting methods and the use of peasant and fishing tools as weapons. These arts were forbidden, and practiced only in secrecy. Usually a master would teach one student at a time, training him at night so as not to be discovered. The Japanese clan of Shimazu conquered Okinawa in 1609. In the process of colonizing, the Shimazu imposed a ban on weapons. Even farming implements were under government control, being stored in special warehouses and checked in and out daily. The Shimazu invasion and subsequent oppression unified the Okinawans against the Japanese. Many of the individual “schools” of Okinawa-te, or do-de, as Karate was then known, united to form more systematic styles. The major Okinawan styles by the middle of the nineteenth century were Shuri-te, Naha-te, and Tomari-te (named after the locations in which they were developed and practiced as well as for the kinds of techniques that each emphasized). Three of the greatest Okinawan Karate masters at the end of the nineteenth century were Azato (Shuri-te), Itosu (Shuri-te), and Higaonna, (Naha-te). The “father of modern karate”, Gichin Funakoshi, studied with all three of these masters, though primarily with Azato and Itosu. Funakoshi was born in Shuri, Okinawa in 1868. He began his study of Karate at the age of 11. It was during his youth and young adulthood that Karate practice became publicly acknowledged. 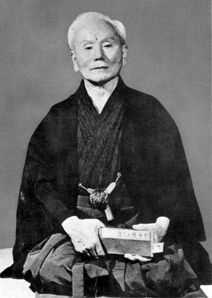 As a teacher in the Okinawan schools, Funakoshi had the opportunity to help his master Itosu establish Karate as a physical education program in the public schools, as well as to participate in many demonstrations of Karate techniques. While Karate was becoming popular in Okinawa, it was still virtually unknown in Japan. In 1917, Funakoshi was invited to Japan to lecture and demonstrate the Okinawan art of karate at a symposium sponsored by the ministry of Education (physical education in Japan at that time consisted largely of Judo, Kendo, and other martial arts training). Funakoshi’s demonstration was very well received and he was invited to teach his art in Japan. In 1922, Funakoshi returned to Japan to do so, and remained there for most of the rest of his life. Jogoro Kano, the founder of Judo and a very influential figure in the Japanese martial arts, gave Funakoshi his support and invited him to teach at the famous Judo headquarters, the Kodokan. Karate became very popular in Japan, and Funakoshi traveled throughout the country lecturing and demonstrating his art. Karate clubs were established at all the major universities. Thousands of Japanese from many walks of life began to study the style of Karate taught by Funakoshi, which came to be known as Shotokan. In 1955 Funakoshi and his senior Shotokan students formed the Japan Karate Association, with Funakoshi as Chief Instructor. The Association was approved by the Ministry of Education as an educational corporation in 1958. This made it possible for leading Shotokan Karate-ka (those who practice Karate) to share knowledge, research, and technical skills, and to establish systematic training methods and instructor’s programs. Shotokan Karate, through the Japan Karate Association, has grown phenomenally since that time, and is now practiced in almost every country of the world. In 1957, Gichin Funakoshi, the father of modern Karate, passed away at the age of eighty-nine. Funakoshi was the Karate-ka primarily responsible for taking a little known Okinawan peasant fighting art and introducing it first to the people of Japan, and then to the world. Thousands of karate-ka began their training under him, and many of the most accomplished Japanese Karate instructors were his students. In Japan and elsewhere, Karate is widely studied by people of all ages and walks of life. Karate is taught in private clubs, in the armed forces and to police, in colleges, in factories, and in corporate physical fitness centers. From its humble beginnings Karate has become a world art. The essence of Karate is the merging of the physical, the mental and the spiritual. The physical principle of Karate is to deliver the greatest possible force, concentrated at the point of impact, with maximum speed. Karate does not require the same type of muscular strength that is used to lift a heavy weight. The force of a Karate blow is generated by several muscles brought into play in a proper sequence. For instance, the abdominal and pelvic muscles are powerful, but slow, while the muscles of the extremities are fast, but weaker. first; this power is then transferred through the extremities to the point of impact. constant training. Eventually, the process seems merely a blur. amount of strength will accomplish little if it is diffuse. A small amount of strength, properly concentrated on a small area, can be incredibly powerful. In Karate, this concentration is called “focus”. The muscles of the body are tensed, but only at the instant of impact, and power is directed toward the point of contact. Another important principle of Karate is the use of reaction-force. In physics we learn that every action has an equal and opposite reaction. In Karate, we punch or strike with one hand and withdraw the other simultaneously, adding the power of reaction-force to the technique being employed. The rotation of the hips is also employed to add this force to techniques. Mental attitude is of great importance in Karate practice. The Karate masters applied two phrases to describe the proper attitude: “mizu no kokoru” (a mind like water), and “tsuki no kokoro” (a mind like the moon). To respond to an opponent, the mind has to be as calm as an undisturbed pond, maintaining the properties of clear flowing water. And, just as moonlight shines equally on everything within its range, we must be calmly aware of our environment to be prepared for any possible move by an opponent. In most of Karate’s defensive techniques, the attacker’s hand, foot, or other weapon is struck, deflected, or in some way thwarted so as to render the attack harmless. A special characteristic of Karate techniques is that they are performed with “focus.” This means that the entire power of the body is concentrated for a very brief time at the point of contact of the technique, and then withdrawn. Another special characteristic of Karate is that even attacking techniques can be used directly for blocking. The intention of offensive techniques in Karate is to render the attacker either unwilling or unable to continue his aggression. Offensive techniques are never to be used against an opponent whose attacks pose no threat. As a sport, Karate is divided into two aspects: kata (forms) and kumite (sparring). Kata are formal exercises that consist of a series of prearranged defensive and offensive techniques, performed in a set sequence against multiple imaginary opponents. The kata include all the various techniques used in Karate for punching, striking, blocking, kicking, and body shifting. The proper execution of a kata involves the use of appropriate timing, rhythm, speed, focus, awareness, and spirit, as well as the performance of correct techniques in proper sequence. Kumite may be prearranged or free-style. In prearranged sparring, the attacker announces the target and the technique to be used, and the defender endeavors to block the attack and counter it. One, three, or five attacks may be made, depending on the type of sparring being practiced. All attacks in both prearranged and free-style kumite are stopped approximately one centimeter—or about one half inch from the target. Free-style sparring, or Jiyu-kumite, resembles boxing in its action, though with a much greater variety of techniques involving both hands and feet. Attacks are stopped short of contact, for obvious reasons. A fully focused Karate technique could permanently injure, cripple or kill an opponent. The ability to focus a strong technique just short of contact is a test of proficiency for the Karate athlete. More highly regarded than technical skill in Karate is the development of character, sincerity, discipline, respect for others, and self-control. Students show respect for their instructor and each other by bowing. Students bow upon entering or leaving the dojo, to the teacher at the beginning and end of class, and to each other whenever two students practice together or spar. Basic Karate Terminology Click Here to open in a new window. The Warwick Shotokan Karate Club and Sensei Andrew Spivack are members of the American Japanese Karate Association - International (AJKA-I). We teach traditional Japanese karate. Our ultimate goal is to develop a well-rounded individual at home, in school, and in the dojo through the perfection of one's self and one's character. Our program is dedicated to developing healthy bodies, sound minds, and self-esteem all balanced with a deep respect for others. This class will help you and your children protect themselves mentally and physically from bullying. We believe that karate is a method of mastering control of our bodies, our emotions, and our willpower. By doing so, we hope to gain greater control of our environment no matter where we find ourselves – at home, at school, at work, or on the street. In addition to teaching self-defense, our major goal here at WSKC is to increase physical conditioning and core strength, reduce stress, and enhance self-confidence. The Warwick Shotokan Karate Club will directly support the growth of your child through a variety of classes, progressive challenges, individualized instruction, and opportunities to compete and interact with other martial arts students in the area, around the country and internationally. Children as young as 4 are welcome to join the WSKC in the Little Shoto program. Adults are welcome to join the main class. Karate is not just for kids! This is an Art that can be learned by anyone, and any age. We are not a belt factory and this is not our main source of income – we have no contracts and no hidden fees! Not really. Since karate will gradually improve your fitness, your starting point is less important than the effort you put into it along the way. Our traditional focus on the basics and on the correct form make it easy for beginners to train together with experienced individuals yet still progress at their own level of fitness and expertise. If you are less fit, your progress at the start will simply be more moderate; as your fitness improves so will the pace at which you advance. You are expected to be committed to your karate training, and to attend classes on a regular basis. You are expected to give your karate training your maximum effort, and to work hard during practice. You are expected to demonstrate the respect, humility and courtesy upon which karate’s long-standing tradition is founded.